Watch IFBB superstar Darrem Charles in the gym 3 weeks out of the 2005 Mr. Olympia. 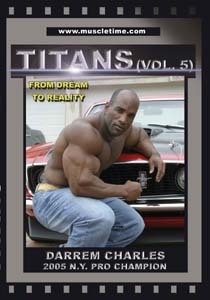 Taped in Fort Lauderdale, FL this DVD shows you an insider look how Darrem trains, lives and thinks. Plus you will see Big D`s cars and house. BONUS FOOTAGE: Darrem in his hotel room in Las Vegas and his fantastic posing routine taped at the 2004 GNC! A Muscletime Production. Running time: Approximately 125 minutes, All Regions, NTSC.